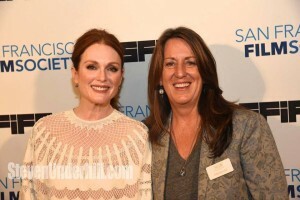 On Wednesday night I attended a special screening of Freeheld at the Castro Theater, benefiting NCLR. It was packed with lesbians—SURPRISE! I was reminded of the time I saw the premier of Desert Hearts at the Castro in 1985…you could have heard a pin drop during some of the intense scenes. While I can’t say this is the best film I’ve ever seen, I will tell you that is an important film, and I was riveted. Freeheld tells the true story of New Jersey’s Police Lieutenant Laurel Hester, who while battling terminal cancer, fights to make sure her partner receives her pension after she dies. Based on the 2007 documentary directed by Cynthia Wade, the film had many intense, funny and poignant moments. It kept me engaged from beginning to end, remembering the way things were, not very long ago. It brought back the late 1990’s in vivid detail. I tried not to get distracted by the fact that Ellen Page looked 12 years old…she is hot. And Julianne Moore is always amazing. Steve Carell was hilarious in his role of a gay activist.